As the first Certified Green Restaurant in upstate New York, Jamie and Marcus Guiliano’s Aroma Thyme Bistro in Ellenville has long emphasized pure ingredients and an innovative and healthful menu. Avoiding the use of butter and heavy dairy products, white flour and refined sugar, chef Marcus Guiliano serves up food that pleases vegans, carnivores and everyone in between. He began his career cooking at various hotels and restaurants: the Depuy Canal House, the Greenbrier, the Broadmoor. He worked for Pierre Koffman at La Tante Claire in Europe. “All this experience taught me how to cook great-tasting food, which was slowly killing me,” says Guiliano. “Overweight, plagued with high cholesterol and 28 years of asthma and facing an operation for acid reflux, a whole-foods diet changed my life. I wanted to bring this knowledge to what we did in the restaurant.” Thus, the couple’s mission to offer gourmet, sustainable, socially responsible cuisine came into being. Aroma Thyme Bistro also offers more than 250 independent craft beers and 300 independently produced spirits and wines from all over the world. “The extensive bar selections shock everyone,” says Guiliano. How did you end up in Ellenville? We’re originally from Ellenville; Jamie and I were high school sweethearts. When we had kids, we moved back from Colorado. Family is very important to us, and both of our parents still live here. We were living here, and Elliott Auerbach, the Ulster County comptroller, said, “You’re the person to open a restaurant here. We need you.” He bought the building and leased it to us, helped us out. What do you call your décor? We have a lot of vintage stuff in the restaurant. These bricks [Hutton Bricks] are from a building right on this street. A person was knocking them down two years ago, and I said, “Don’t throw away those bricks; I’ll use them!” I have a lot more out back. The shelf is from the old train dock. It’s American chestnut; I have 20 of those pieces I’m waiting to use. The bar is from Kingston; it’s Cassidy and Sons. I don’t even know how old it is. These are the original cooler doors. The church pews came locally. These days there are so many ideas of what is good to eat and what’s not. How do you incorporate all of this into your menu? I’ve tried to reduce, but not avoid gluten altogether, unless a customer requires it. We have a conversation to find out if it’s an allergy or a preference. At that point, we make sure their food is totally segregated out of the kitchen, and that we’re not working on anything else at the time. We take care. The biggest thing is, people are after real food. No matter what diet it is, you want real food – whether you’re vegan or vegetarian or paleo. You want better-quality meat and vegetarian food. That’s the whole premise. Even if you do eat sugar, you want a better sugar: organic sugar, coconut sugar, organic local maple syrup. It’s about real food, real producers. Are we perfect? No. We are very conscious. We even balance the social aspects of the food. For example: quinoa. It’s a very healthy food, comes organic. But the way it’s marketed globally has jacked the price up so high for the locals, we’ve robbed the South Americans of their main source of nutrition. We solved that problem in 1997-98 by buying quinoa from America. You need special equipment to take the saponin off it. You and I couldn’t just go grow a crop and eat it. You have to have the machinery that will take it off. We buy our quinoa from Colorado. We’ve been on the farm many times. We have a relationship. Their quinoa has been twice the price all along. That’s what you have to do to offer socially responsible food. Distributors, packers will substitute products all the time. You have to be really careful. Even the big organic packers: They source the cheapest organic product they can at the time. They make sure it’s organic by somebody’s standards and put a label on it. I feel uncomfortable with that. I’d rather buy canned tomatoes from Jersey year-round. They might not be organic, but they’re local and the same quality. Sometimes farmers do a better job without the restrictions. For our Green certification, for example, we use a hand soap that is a super-clean product. And it’s made by an independent company. 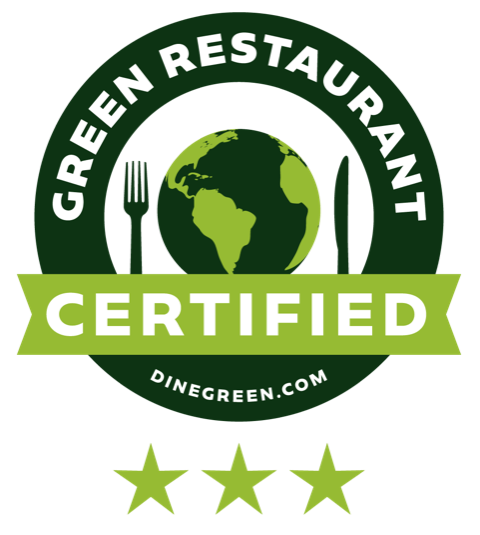 The Green Restaurant Association doesn’t like it because it doesn’t meet their criteria. Part of their criteria is you have to pay $2,500 to get certified. I said I don’t want the points for my hand soap; I want to keep buying from Jerry and Susan, who own the company in LA, who have their family grow the product in Australia, the tea tree oil. I can call him anytime, and he’ll talk me through the science of everything they make. I could go to Home Depot or Staples and buy a product that’s on the approved list. But I’m not going to Staples. It sounds like you need a staff person researching all the time. Which is me. It’s constant research. We go to trade shows where you find the really cool new innovative stuff like cactus water, which is just as good and healthy as coconut water. We go to the organic shows that really fit our niche. And the mainstream shows are now flooded with organic and sustainable and grass-fed and wild. People are understanding the importance of it now. I noticed on your website that you use Young Living natural oils. We use them for a couple different recipes, and we use the lemon oil in our tap water. Certain sauces are made with ginger oil, lemon, lime. The lime oil makes a great crème brûlée. When you zest a citrus fruit, you have to contend with using the rest of the fruit. They don’t get used, tossed. It’s our answer. I was first introduced to the oils through alternative health. I did a lot of research back in the early 2000s. More companies out there are doing it right, but the consumer has to know that they can’t just pick up any essential oil and put it in food. They’re not all food-grade. There are always new things. We now do travel trips to Italy. Our first one is kicking off this fall. We’re so in tune with who we buy from that there are no big brands behind the bar or in the kitchen. Even our salt and our sugar – we know the owners. We travel a lot to vineyards in the Finger Lakes, Napa, El Dorado: all small producers. We decided to put our own trip together. We have 22 people booked to go to Italy. It’s a chance to have an in-depth wine tour, like having backstage passes. We’ll meet the families who make the wine in their houses, villas, on their property. Some have tasting rooms, and some, we’ll be sitting on their porch drinking. Our premise is “real food, great bar.” We pride ourselves in supporting the truly independent companies. We don’t want to sell you something from a national or international conglomerate that doesn’t care about our community, doesn’t care about the environment or their employees.We just can’t support a company that does that. We’ve seen it in Ellenville. Even if 12 people lose their job here, that’s an impact. Given that you stand for integrity, in 14 years has it ever been difficult for you to maintain those standards? It was a challenge in the very beginning, and we weren’t as strict. It all happened because when we got our liquor license, we had Absolut, Grey Goose, Ketel One. And next to these, I’d have three small local vodkas from California or Tuthilltown – and they weren’t selling. And they were getting higher ratings than the other vodkas. So we made a choice not to sell a big brand name. I’ve had people get up and leave because they couldn’t get a Jack and soda. We don’t even have soda! You can get it at any restaurant. Initially, it did hurt business. Some people don’t get it. They’ve said, “Your food’s so expensive.” I had to explain the whole social impact of food and the ingredients we use. The crabs you’re eating at the Chinese restaurant are probably from the Mekong Delta for a dollar each. Cheaper food is not a better value. Our prices aren’t out of line. It’s all about customer expectations. I can’t support a big company. I can’t give them our money. I want to be able to call someone on the phone and know where our money is going and get an invite to the distillery and the brewery. They see that we support their brand, and they say, “Why’s this little restaurant in upstate New York buying so many bottles of our cognac? What are they doing? What’s so special up there? Why can’t other restaurants sell as much of our cognac as they’re selling?” Because the Courvoisier and Hennessey is right next to it on the shelf. So, is there a distributor who delivers all these different brands? We go through about 20 different distributors. It’s a logistical nightmare. Some are self-distributed. When you find something that’s cool and exciting – even if we’re driving to the Finger Lakes and we find a whiskey that they don’t distribute in our area – we go through the legal wholesale regulations so we can pick up a case. And when it’s gone, it’s gone. I’ve been doing more professional speaking and consulting. My book [with Carl Solomon] is just out: 50 Mistakes Business Owners Make. I belong to a “mastermind” group where I lock myself in a conference room three times a year for three days, and all of us restaurateurs, we share all of our marketing ideas, everything. If you can do it in Ellenville, you can do it anywhere. Aroma Thyme Bistro, Monday/Tuesday/Thursday, 5-10 p.m., Wednesday closed, Friday, 3-11 p.m., Saturday, noon-11 p.m., Sunday, 11 a.m.-10 p.m., 165 Canal Street, Ellenville; (845) 647-3000, www.aromathymebistro.com.